If you have ever questioned the enormity and the drama of our universe, these photos will set you straight. The Royal Museums Greenwich in London selected these 17 stunning images, from more than 2,700 entries, to be considered for their annual Astronomy Photographer of the Year Competition. The winner will be announced on Sept. 17, after which the winning images will be exhibited at the Royal Observatory Greenwich. From stars shining over salt flats in Bolivia, to the Lagoon Nebula thousands of light-years from earth, the photos reveal a gorgeous and diverse array of astronomical phenomena from 2015. Take a look below. Captions provided by Royal Museums Greenwich. Following his first up-close encounter with a black bear, the photographer was relieved to reach his destination safely and capture this phenomenal image. 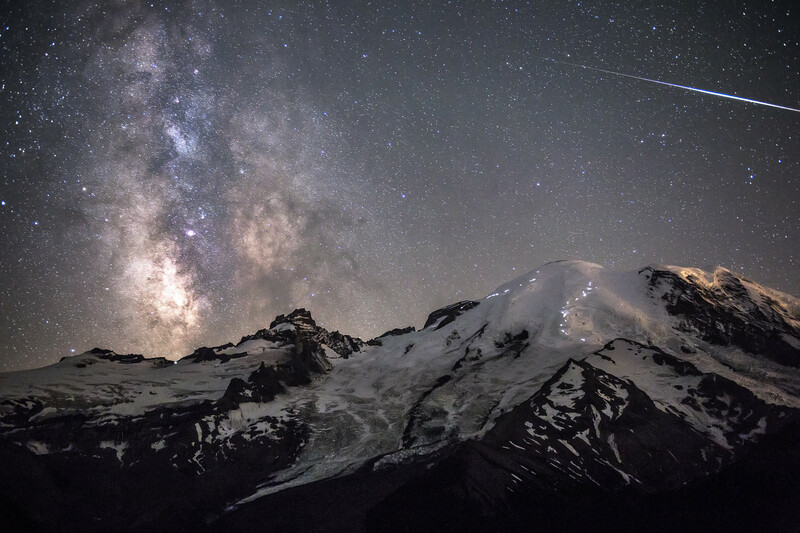 A meteor can be seen piercing through the darkness as the Milky Way towers above the 4,392m peak of Mount Rainier in Washington, USA. The white lights dotted across the rocky paths of the mountain’s face are the headlamps of hikers ascending to the peak. The vivid green Northern Lights dance above Lyngenfjord, the longest fjord in Troms county Norway, tracing out the shape of the Earth’s magnetic field above the waters. The most common colour associated with aurorae, the green is produced by oxygen atoms and molecules energised by the impact of solar particles that have escaped the Sun’s atmosphere, causing them to glow brightly. 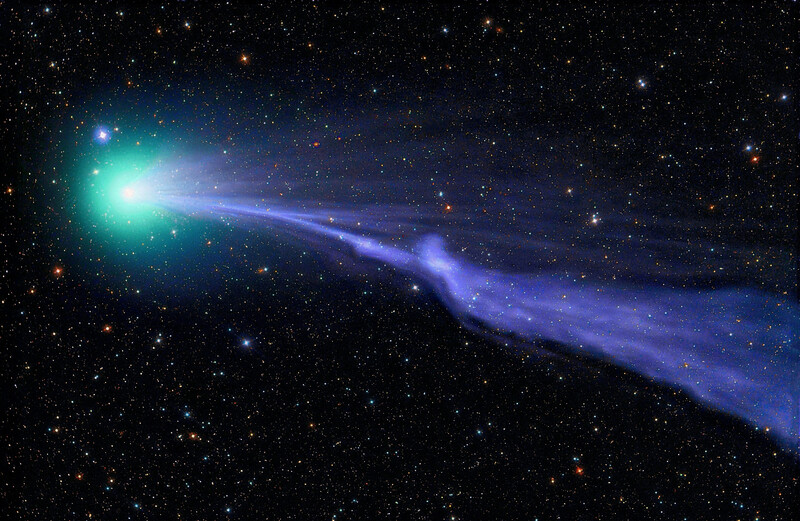 Comet Lovejoy sails through the solar system in a green haze leaving cometary dust in its wake. C/2014 Q2 is the fifth comet to have been discovered by Australian amateur astronomer and astrophotographer, Terry Lovejoy. Towards the end of 2014 and into the beginning of 2015 the comet could be seen through binoculars or in some special cases with the naked eye soaring through Earth’s skies. The radiant blue-green contrasting against the backdrop of the night sky is due to the diatomic gas burning off it as it travels through space, and the disjointed tail illustrates the effects of a disturbance caused by solar winds. A phenomenal natural light show of a lightning storm emanating from the underside of ominous storm clouds juxtaposed with the gleaming stars of the Milky Way above them. 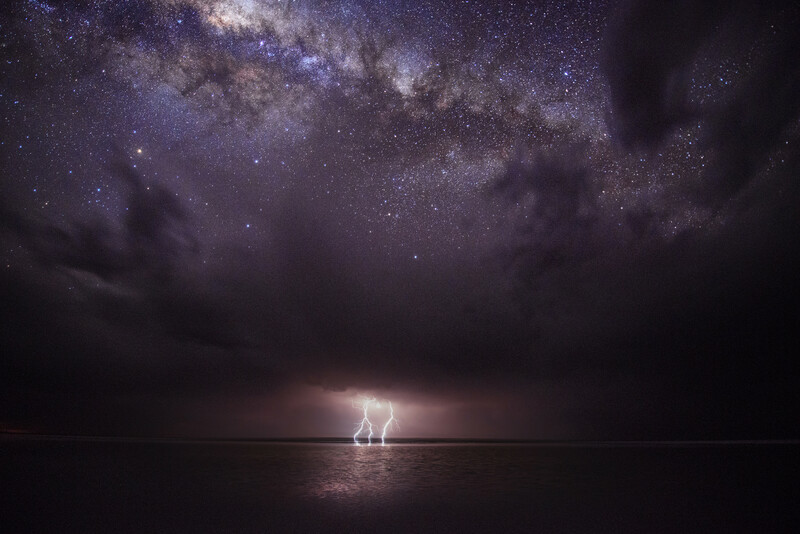 The photographer had watched the storm front over Kati-Thanda-Lake Eyre National Park in South Australia for around two hours before capturing this tumultuous scene, using a graduated filter upside down to balance to exposure from top to bottom to showcase the beauty of our Galaxy. 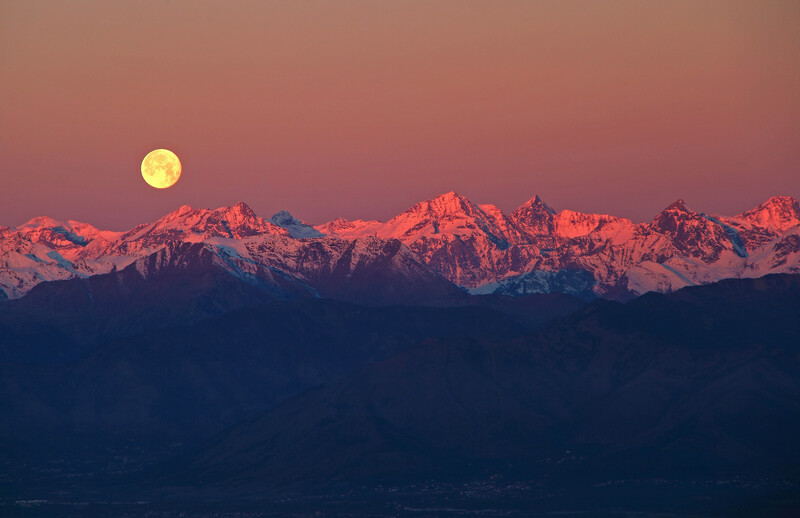 The majestic sight of the full moon setting behind the rose-tinted Alps. Taken in the silent surroundings of Superga hill in Turin, Italy, mere minutes before sunrise. The hypergiant star Eta Carina glows against the background of swirling clouds of dust and gases that form the Carina Nebula. 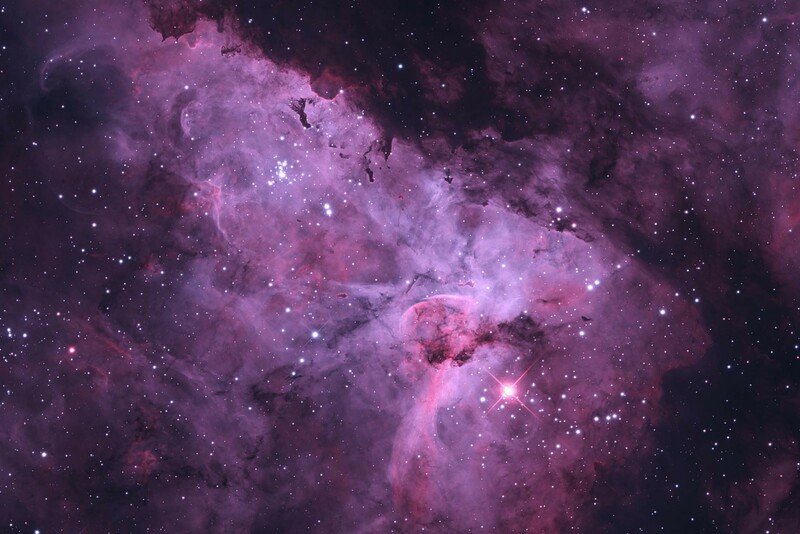 The Carina Nebula is one of the largest diffuse nebulae - meaning that it has no well-defined boundaries - in our skies and is about four times as large as the famed Orion Nebula. Situated some 5,000 light years away, the stellar nursery of the Lagoon Nebula lies in the constellation of Sagittarius. 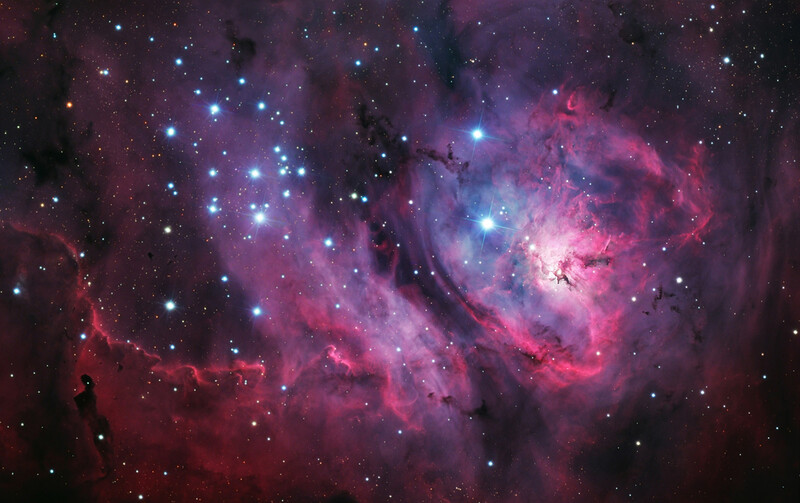 Despite being light years away the Lagoon Nebula is in fact one of the few star-forming nebulae that it is possible to see with the naked eye in optimum conditions from mid-northern latitudes. 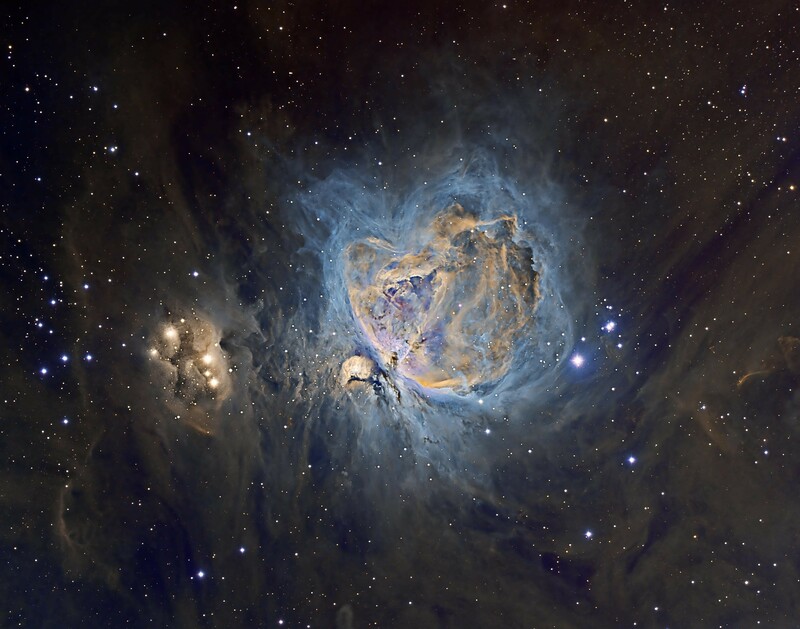 One of the most well-known astronomical objects in our universe is the Orion Nebula and this image depicts the wider region of the Orion Molecular Cloud Complex that is home to it. This complex is also home to another popular target for astrophotographers, the Horsehead Nebula, as well as Barnard's Loop and the Running Man Nebula that can be seen to the left of this photograph. The pinks and oranges that can be seen in the whorls of the nebulae are caused by the extremely hot hydrogen gas present in the structures. Late afternoon at San Vito di Cadore, Italy the moon shines over Monte Antelao. 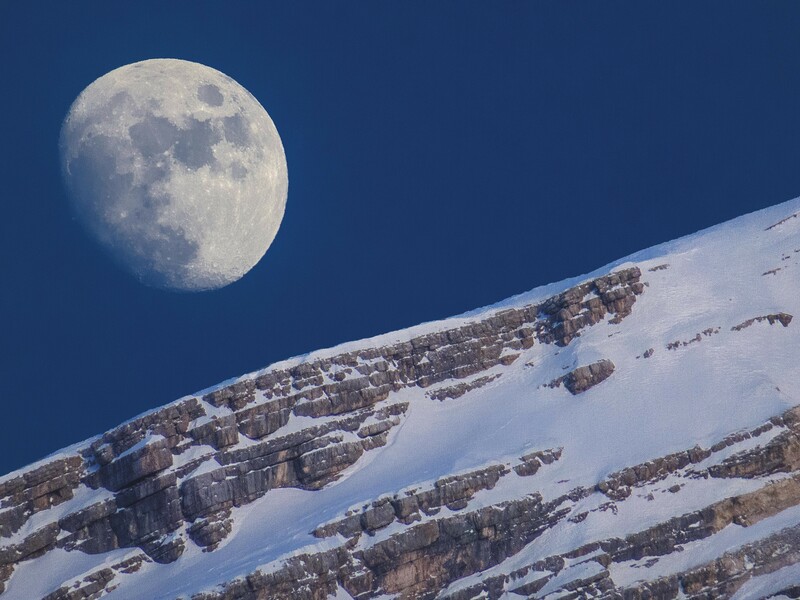 The snow-covered dolomite ridge of the mountain and the Earth's only natural satellite bear a striking resemblance to one another, contrasting against the bright blue of the afternoon sky. The photographer noted the likeness of the image to a snowball bouncing down an inclined plane. 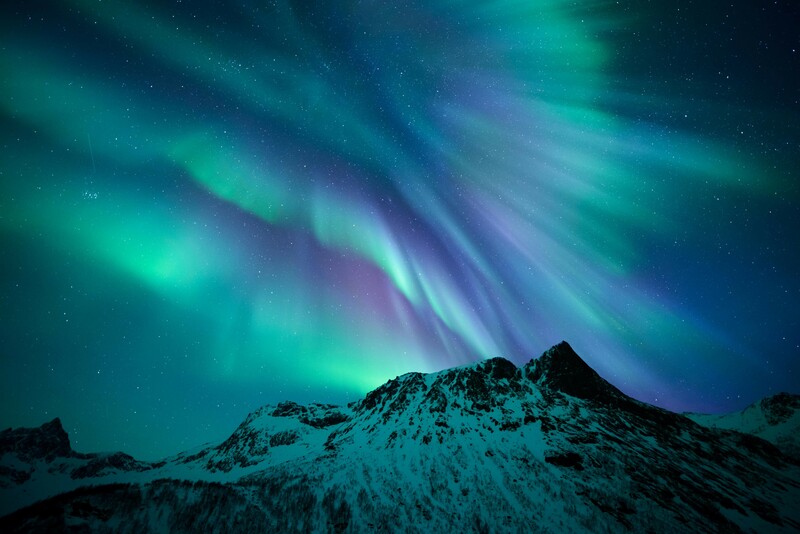 Living in Norway, the photographer had seen his fair share of aurorae, but on 21 January 2015 he witnessed the strongest variety of colours he had ever set eyes on in this beautiful explosion of purples and greens. Careening over the peaks of Senja, oxygen produces the greens and nitrogen the purples, seen in this particular display of the Northern Lights. 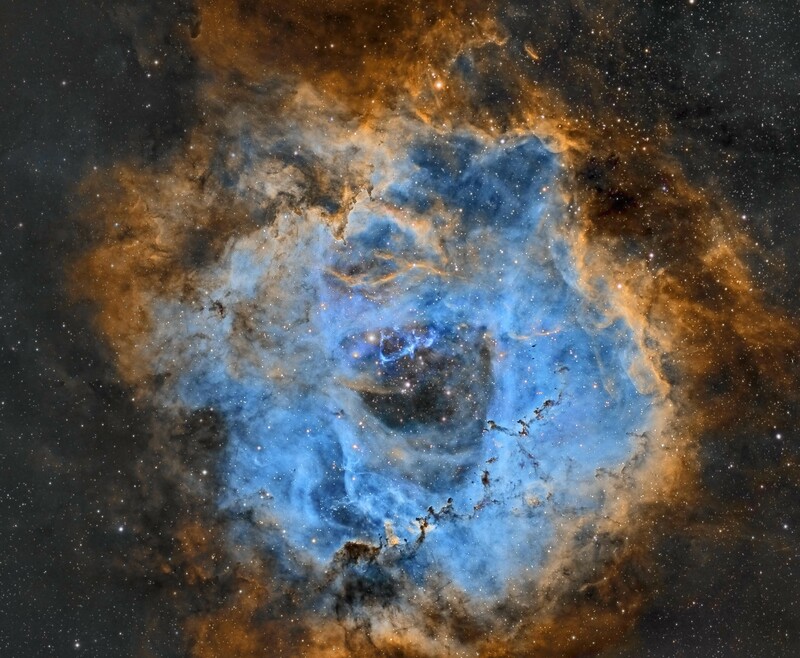 Measuring 50 light years in diameter, the large, round Rosette Nebula is found on the edge of a molecular cloud in the constellation of Monoceros the Unicorn. At the core of the nebula the very hot young stars have heated the surrounding gaseous shell to a temperature in the order of 6 million kelvins resulting in the emission of copious amounts of X-Rays. 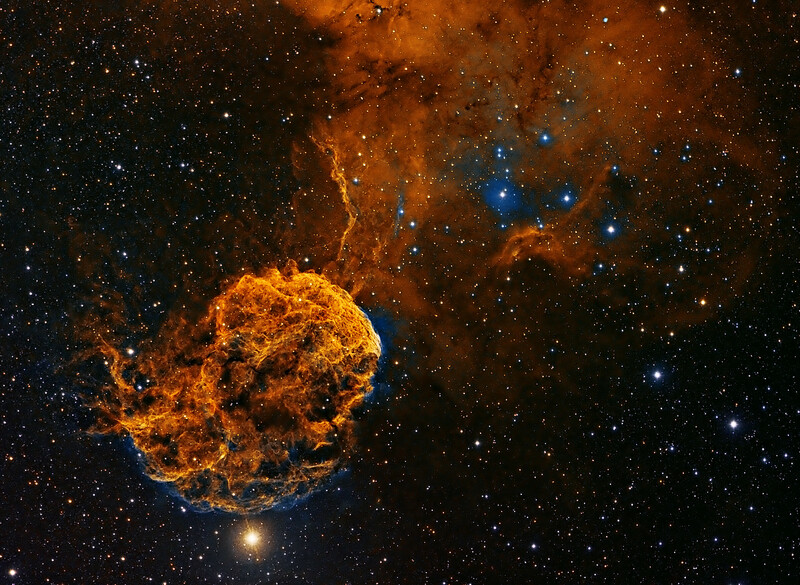 Here the photographer has applied a false colour palette to several pictures using narrowband filters, which only allow a specific colour of light to reach the camera, with each one linked to an interstellar gas, resulting in the striking blues and oranges. 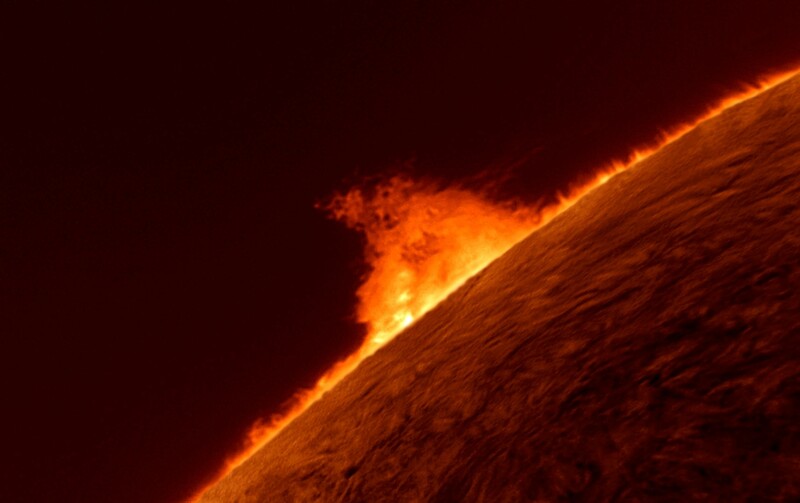 Searing hot loops of plasma radiate from the edge of our local star – the Sun – in a phenomenon known as a solar prominence. Emanating from the Sun’s photosphere; its outer shell from which light is emitted, prominences extend to the corona, which is the aura of the plasma surrounding it. A typical prominence covers over thousands of kilometres, with the largest ever recorded estimated to be over 800,000 kilometres, equalling roughly the radius of the Sun itself. 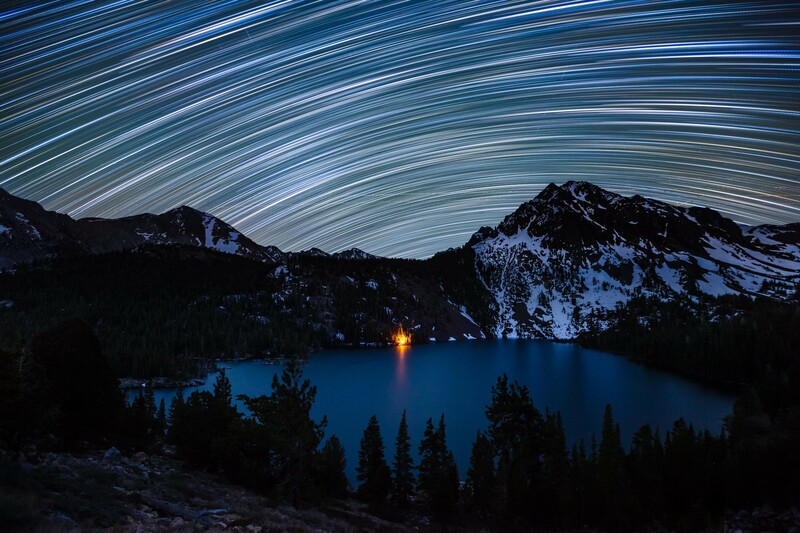 Star trails illuminate the night sky over a campfire-lit Green Lake in the Hoover Wilderness of California. Star trails are a popular subject for astrophotographers to capture using long-exposure times. Whilst they appear to illustrate the movement of the stars, they are in fact depicting the rotation of the Earth on its axis. 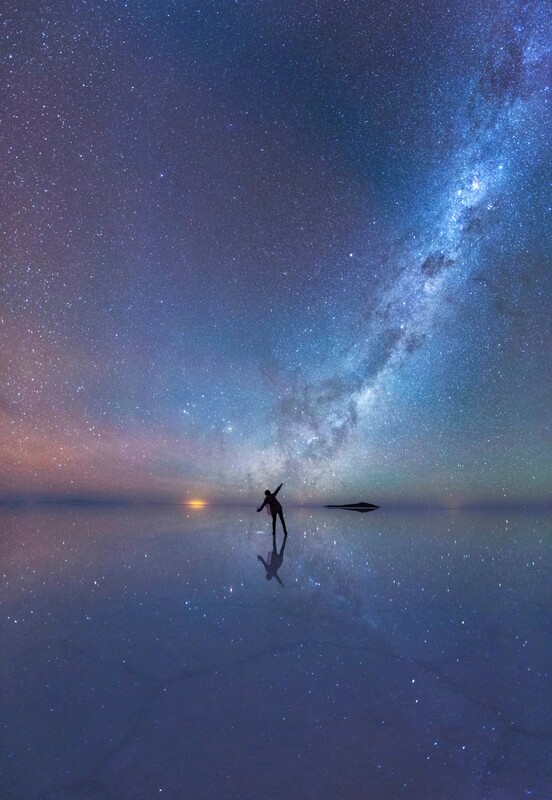 An enthralled stargazer is immersed in the stars as the luminous purple sky is mirrored in the thin sheet of water across the world’s largest salt flat, Salar de Uyuni in Bolivia. A rare sighting of a red aurora, caused by the emission of high-altitude oxygen, captured on film, dancing over Yellowknife, the capital city of the Northwest Territories in Canada. 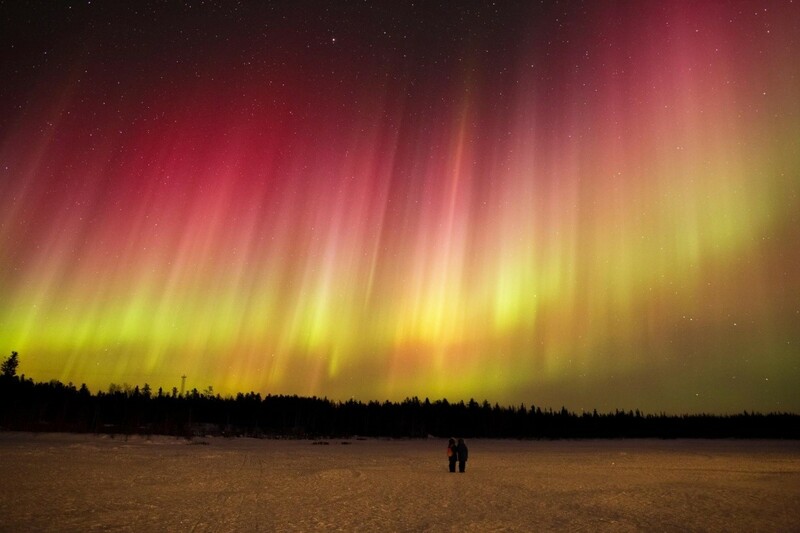 The aurorae are a result of a large geomagnetic storm caused by a coronal mass ejection. 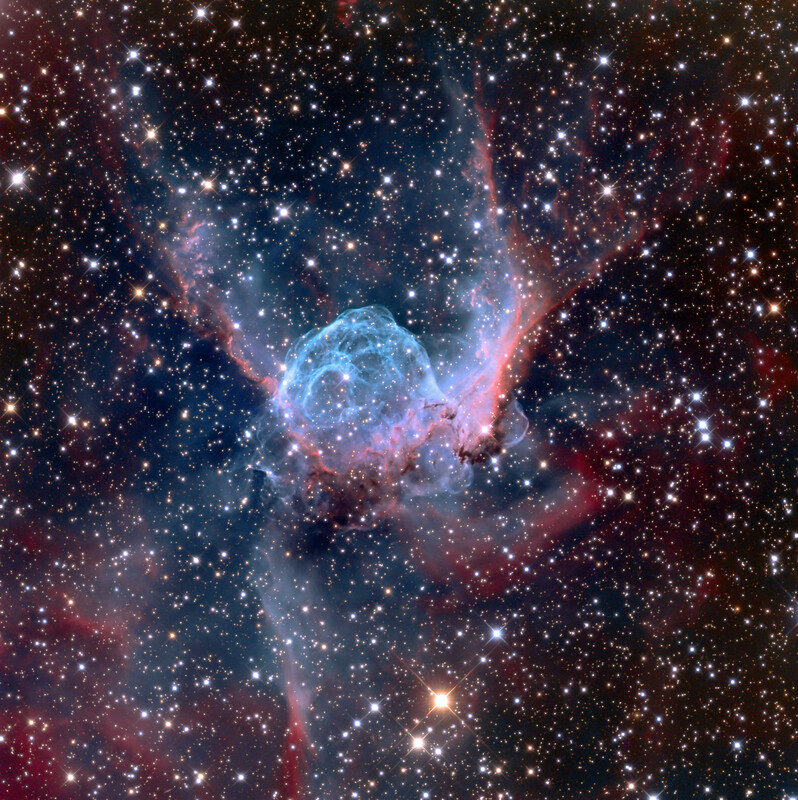 The distinctive shape of the nebula NGC 2359 has led to it also being known as Thor’s Helmet, resembling the headgear of the Norse God (and Marvel superhero). Around 11 thousand light years away, the overall bubble shape is mainly due to interstellar material swept up by the winds of the nebula’s central star Wolf-Rayet, an extremely hot giant thought to be in a pre-supernova stage.